Miniature Maven Diaries: Look what I found! I can't just post a short post either. Oh, no, that will never do! 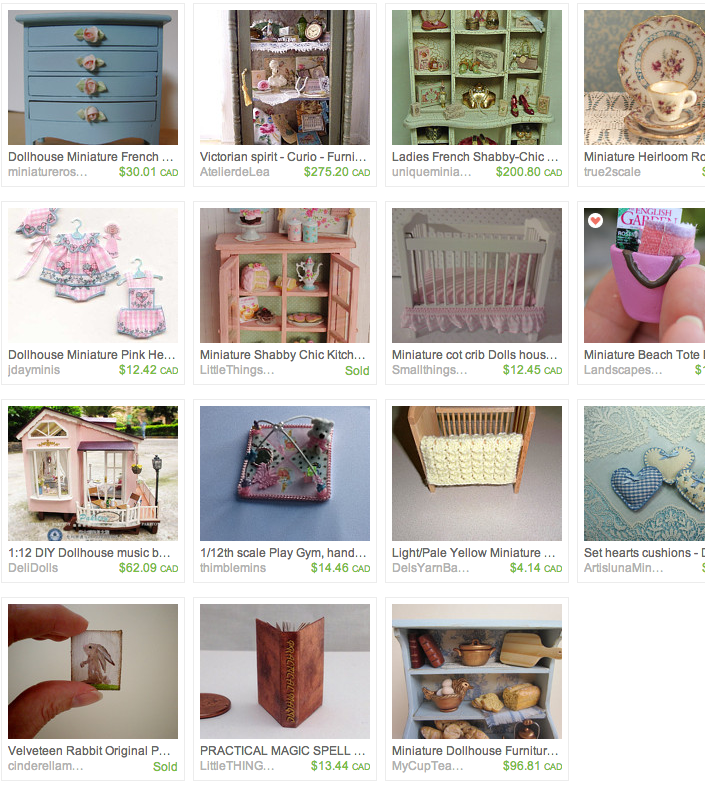 About a week a go I created an Etsy treasury to help out my fellow Etsy Miniaturist Artisans. They recently changed the way people can search and find Etsy Miniaturist Artisans on Etsy, making it harder to find us! Lots of us are trying hard to make a living at something we love to do, so this is my way of saying to my favorite artisans, I love your work, and I hope to help you sell your beautiful creations! Of course, not everyone can afford to buy minis on Etsy, but who doesn't enjoy looking at beautiful things! So I hope you enjoy this treasury of beautiful hand pick items curated by me. Who can create an Etsy Treasury? Why anyone! You simply have to create an Etsy profile by entering your email and creating a password, and you're off! For a more detailed explanation in how to create an Etsy treasury, when you go to Etsy, click on Help, and type in How do I create an Etsy Treasury. The directions are very simple! To share an Etsy Treasury on your blog, you can use a browser extension called screen capture. Hint: This is the extension I use to create my blogging tutorials! I use Chrome Browser, but screen capture is also available in Safari Browser and it wouldn't surprise me if it were available in internet explorer as well. So sit back and enjoy the wonderful treasury I have put together for you! Well folks, I have to go. So many things to do, so many people to see...I will tease you a bit and say that the giveaway I have been planning to do on my miniatures blog is coming up fairly soon. It will be a different giveaway I can promise you that...I have not seen another giveaway like it anywhere else on the web. It will be a wonderful treat for all my lovely followers! Your treasuries are so beautiful. I'm so honored to have been featured in them! :) Have fun staying busy! And thank you for the advice on the roombox. I enjoyed your blog and I am going to follow you. I love all the items, I wish I had the patience to create them. I'm trying to create in 1:6! Yeah, it been on the back burner, lol.